Ali Blake from the Dream Club Mysteries here! As you know, I love to experiment with new recipes for our little candy shop-cafe, Oldies But Goodies. One of our most popular items is "goodies to go." That means anything you can hold in your hand, put on a stick, or scoop out of a disposable cup. We have a whole menu devoted to these fun items! 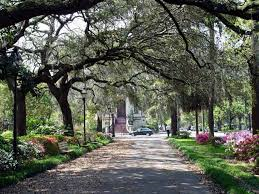 Savannah is such a beautiful city that most of our customers want to get something quick and eat it on the go as they explore the Riverwalk and the Historic District. Of course, some customers like to linger in the shade of our umbrella tables in the back garden, but I'll save those recipes for another time. 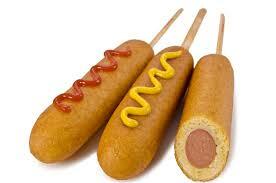 I've always been a fan of corn dogs. I use veggie dogs when I make them, but I realize some folks like the real thing. All you need is corn bread batter and whatever kind of hot dog you like. Plus some wooden sticks you can buy at a craft store or the grocery store. They're very easy to make, just remember to get the oil at 350--if you drop them in before that, they tend to get soggy. They should be crisp and delicious if you get the batter right and get the temperature right. 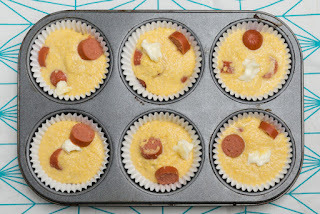 The batter can't be too thick, or the corn dog will taste "doughy." and it can't be too thin, or it won't stay on the hot dog or veggie dog. Experiment and you'll quickly get the hang of it. I have a special cornbread recipe that I've used for years, but probably any recipe will do, even the mixes you buy at the supermarket. 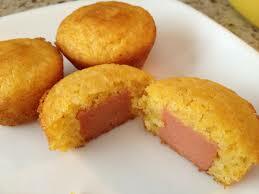 I decided to experiment with mini corn dog muffins and they were a huge success. 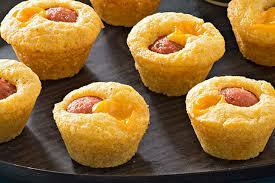 You can make them in muffin tins, or mini muffin tins. Don't they look good? And of course, they're baked not fried. If you like pigs in a blanket (I do!) you can try something completely different and use poppy seed dinner roll dough wrapped around a hot dog and use a skewer. 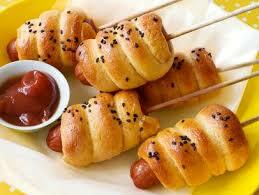 Yes, I know it's not a corn dog, but these are really tasty and our customers love them. I take the dinner roll dough apart, roll it into "strips" and then wrap a strip around half a hot dog and put a stick in it. Then just sprinkle with poppy seeds, bake them in the oven and voila! I hope you'll try these at your next picnic or get together! And of course, if you're ever in Savannah, Taylor and I would love to have you stop by. There's always sweet tea and home-made lemonade waiting for you at Oldies But Goodies--on the house!